Place the breadcrumbs, half the tarragon, half the butter, salt and pepper in a large bowl and mix to combine. Place on a large oven tray and cook for 10 minutes or until golden. While the breadcrumbs are cooking, heat the remaining butter in a large ovenproof pan over high heat. Add the leek, garlic and broccoli and cook, covered, for 5 minutes or until softened. Place the fish, flour, salt and pepper in a large bowl and gently toss to coat. Add the fish mixture, remaining tarragon, sour cream, mustard and water to the pan and stir to combine. 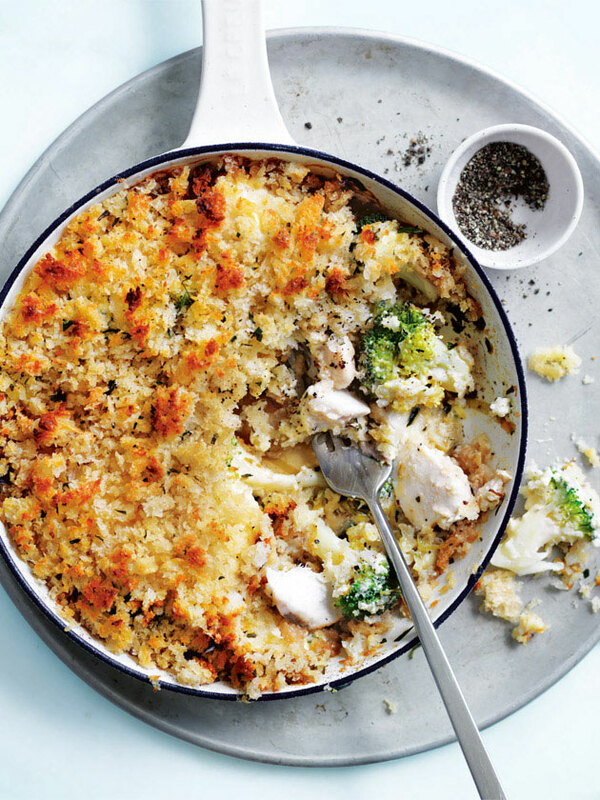 Top with the breadcrumbs and cook in the oven for a further 10 minutes or until golden brown and cooked through. Sprinkle with pepper to serve. Serves 4. Super simple and so tasty, the children devoured it. Stunning…easy and quick to prepare, and full of flavours. What could you ask for! An easy and tasty recipe for weekend cooking. Also encourages healthy eating with a good dose of veges and fish!